Having a thick, luscious beard has always been a point of pride for me. However, it has also been a point of great distress. Back when I was a shaving amateur, the thought of having to do it every day was a great source of stress in my life. I wasn’t alone, apparently, as the number of men between 18 and 24 who claim to use no shaving products has increased from 13% to 15% in last few years. The stress that I would feel from having to shave changed, however, as soon as I decided to learn everything there is to know about shaving. Through a great deal of trial and error, experimentation, reading and practicing, I became an expert in shaving. In this guide, I will be reviewing 13 of the most outstanding products I have tried so far. In addition, I will provide you with useful into, tips and recommendations that will help you become a shaving expert such as myself in no time. Without a doubt, cartridge razors are one of the most popular types of razors today. A lot of it has to do with its practicality: Their simple design consists of a straight handle with a typically flexible and removable head on top. The head normally has three blades that are movable in order to adapt to the contour of your face. The simplest type of razor available is, undoubtedly, the disposable razor. As its name indicates, it is meant to be used only a couple of times before being discarded. This type of razor has the head and the handle permanently attached to each other. Despite being the most traditional type of razor available on the market, the straight razor is still a widely popular item. It consists of a blade that can be folded into a handle for safety. Also known as cut-throat or open razors, straight razors feature a simple design that can be very effective. However, you must have a certain level of skill and a great deal of patience to get a fine shaving with this type of razor. Featuring a guard that prevents the skin from getting cut, this type of razor is, as its name indicates, very safe. Inside the guard, it has a double-edged blade. It also has a straight handle that is permanently attached to the head. The most high-tech of all the types of razors, the electric razor is convenient and easy to use. There are two sub-types of electric razors: Foil and rotary electric razors. While the former has a foil at the top that prevents direct contact of the blades with the skin, the latter has three circular blades protected by an open metallic cap. One of the most important things I consider before making a razor purchase is its overall quality. Take into account the materials it is made of. If it has plastic, I make sure it’s not a cheap, flimsy plastic. Also, I check out the quality of the blades: Are they stainless steel? Are they corrosion resistant? Is it performing close, sharp and smooth shave? If it is an expensive razor, I always want to find out why that is. Typically it’s extra-durable it comes with spare pieces or it has a special feature (lubrication, thin blades, cooling technology, precision trimmer) worth paying extra for. On the other hand, if it’s cheap, generally it is disposable and it’s made of low-quality materials. In order to provide a good shave, all razors need to be extra-sharp. If you see a razor that seems less than perfectly sharp, don’t waste your time. In addition to the sharpness of the blade, take a look at its construction and the material it is made of. If it is made from a cheap metal, it will not stay sharp for long, and you will probably have to throw it away soon. If the blades aren’t set in proper angle or it’s not properly sharpened, it can cause more harm than good, including razor bumps, scrapes and even cuts. Take this into account before making your purchase. The first product on this list is also one of the most popular on the market. Featuring a head with five blades, the Gillette Fusion5 ProGlide is capable of providing a very close shave without damaging your skin. In addition to its blades, the product features a secondary trimmer for reaching difficult spots, an enhanced lubricant strip and the brand’s proprietary FlexBall Technology, a system that allows the blades to adapt and respond to the contours of your face as you shave. Using the thinnest, finest blades possible, this razor by Gillette can guarantee a very smooth and even shave. These blades are made of stainless steel, a feature that makes them long-lasting and durable. Meanwhile, the razor’s body is made of a sturdy high-quality plastic that is, at one time, durable and resistant to impact. In addition to its high-quality construction, the body of this razor is very ergonomic, resulting in a secure grip that increases efficiency and precision during every shave. In terms of performance, this razor definitely stands out among the competition. Due to its construction and design, this shaving tool for men is particularly efficient. A lot of this has to do with the Anti-Friction technology that graces each and every one of its blades. This technology allows the tool to provide a close, smooth shave without causing discomfort or damaging your skin. Working in synchronicity with this technology, the product’s FlexBall system makes the entire process of shaving even more effective. FlexBall Technology allows the blades to adapt to the contours of your face. Anti-friction blades provide a smoother shaving action. Comes with four blade replacements. Individual blades are not durable. Despite featuring only three blades, the Gillette Mach3 is a very efficient razor when the time comes to get a clean, smooth and close shave. Largely, this has to do with the positioning of the blades: By moving according to the type of movement you are making, these blades can get rid of all the hair on your face in fewer strokes. It also features a lubricating strip that, apart from moisturizing your face as you shave, indicates when it is time to replace the head with a new one. The three blades that this product features in each head use Gillette’s proprietary DuraComfort technology. As its name indicates, this technology has a dual action: On one hand, it provides additional comfort by reducing pulling and scraping to a minimum. On the other hand, the technology makes the blades extra resistant to friction, resulting in great durability. As a result, each razor head lasts up to 10 shaves without becoming dull or becoming dented. Even though it provides an extra-sharp hair cutting action, this product is remarkably safe and gentle on your skin. To a large extent, this has to do with its advanced skin guard. This section of the blade touches your skin before the blade does, prompting your pores to open and preparing the hair to be cut while simultaneously protecting the skin. Take into account that the overall shaving process is much more effective when the product is used in combination with a compatible shaving gel. Ergonomic blade positioning for a closer shave. Patented DLC Comfort Edge technology helps minimize irritation. The lubricating strip includes an indicator for replacing the blade. Compatible with all Match3 razors. Features advanced skin guard for extra protection. Requires slow and patient strokes. Its lubricant strips can cause clogging. The Gillette Fusion ProShield offers many of the same features as other Gillette razors, many of which are featured on this very same guide. Among them, you have five blades with DuraComfort technology, the brand’s proprietary FlexBall system for adapting to the contour of your face and the time-sparing Precision Trimmer on the back of the cartridge. This razor’s ProShield lubrication system sets it apart from the rest by providing levels of lubrication. In terms of materials, this product does not fail to live up to the height of Gillette’s standards. The five blades that make up the razor’s head are made of stainless steel, ensuring not only an ultra-sharp shaving action but also providing anti-rust and anti-corrosion capabilities. The body and handle of the razor are made of strong and durable high-quality plastic that does not become deformed through use and is very resistant to breakage. Taking into account its use of the most high-profile Gillette technologies available, it can be said that this product is above-average when it comes to performance. This performance is elevated by its incorporation of the aforementioned ProShield technology. Apart from lubricating your skin before the blades have a chance to act, this technology shields the skin from the type of damage that would otherwise result in irritation. All in all, this is a very strong product by Gillette that many users with sensitive skin will greatly appreciate. Extra-thin blades for less tug and pull. Compatible across all Fusion5 products. ProShield technology lubricates before and after each stroke. Includes precision trimmer for reaching difficult spots. This premium Gillette product offers many of the systems and technologies that have made other razors by the same brand very successful. However, this item is not without its particularities and unique features. Among them, you can name its Precision Trimmer, a helpful feature that helps reach difficult spots. Additionally, you have its fading lubrication strip, a feature that, apart from providing lubrication, indicates when you need to replace the head of the razor. Using high-quality precision blades that are very close together, the Gillette Fusion Manual provides a close and clean shave while exempting minimum pressure on your skin. As you probably know already, less pressure and force during every stroke typically translates into less damage being inflicted upon your skin. However, in my experience, the small amount of space between the blades make them more likely to get clogged by cut hair. The product’s gentle action on your skin is further enforced by its lubricating strips that, despite not being the most efficient on the market, do their job very well. Even though it is great with shorter facial hair, this product’s design does not make it very efficient with hair that is over five days old. Of course, when you want to achieve a quality shave, it is not all about the quality of the blades. 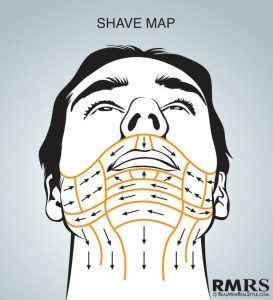 For example, the razor’s mobile head and flexible blade disposition play a huge role in ensuring that every stroke removes as much hair as possible in an even and harmless fashion. This results in a better, more comprehensive shave that is helped even further by the inclusion of a back precision trimmer for reaching difficult spots. Its razor replacements have a long lifespan. Works great with shaving gels of all brands. Includes a precision trimmer in the back for reaching difficult spots. Features five blades for an ultra-close and smooth shave. Not a very fast razor. Due to a complex design, it can get clogged. If you are anything like me, you are looking for a razor that adapts to your personal shaving needs and style. It’s designed to deliver a personalized shave, this product uses the brand’s proprietary Shock Absorb technology in order to auto-adjust according to your shaving style. In addition to this system, the razor features a larger-than-normal lubricating strip that can also be customized according to your preferences. The Schick Hydro 5 Sense razor features five sharp blades that act in synchronicity to provide a super-close shave. Each and every one of these blades has its own blade guard for preventing skin-damaging, painful accidents. Apart from its main shaving action, this razor is capable of delivering a precision-cutting action in order to reach difficult spots in detail. You can switch between the main shaving mode and the precision trimming mode with a simple flip of your thumb. In action, the Schick Hydro 5 Sense is a very efficient razor. Apart from providing a great level of sharpness, its shock-absorb technology ensures that the amount of pressure you provide on every stroke is regulated in order to ensure an optimal shaving action. However, the best feature that this product has to offer is its customizable lubricating gel strip. There are three different types of gel that can be loaded into this razor: Hydrate Gel with coconut oil, Comfort Gel with Herbal Extracts and Energize Gel with menthol. Features hydratant formula with coconut oil. Features a flip trimmer that helps reach difficult spots. Features skin guards that protect your face from irritation. Shock Absorb technology auto-adjusts based on your shaving style. Blades become dull very quickly. Not suitable for very thick beards. Without a doubt, the most impressive piece of trivia about this product (and all Harry’s various products) is that it is made in a German factory that has been producing razor blades for over 100 years. As you may expect, this amount of experience does not come without some clear advantages. Apart from being sharp, these blades are remarkably durable, allowing you to use them for prolonged periods of time before they need to be replaced. By most accounts, the most beneficial aspect of this Harry’s product is its comprehensive nature. Each cartridge that bears this name includes all the pieces you would need for shaving properly: Four sharp and durable blades, a flex hinge, a lubricating strip and a precision trimmer that allows you to reach difficult places as well as creating wonderful details that will set your look apart from that of others. All the parts that make up this product by Harry’s are 100% recyclable. If you trust the opinions of the hundreds of customers that reviewed this product, the greatest thing about it is its relentless efficiency. Simple and practical in its design, the tool really shines when the time comes to get rid of a one-week-old beard in a matter of minutes. Men with coarse, thick hair may particularly enjoy this razor as it is effective at removing this type of hair without pulling or ripping it. In addition, this product comes in a resealable package that you can use to keep it protected. Features extra-sharp stainless steel German blades. Flexible hinge for reaching difficult spots. Bought separately from the handle. With this product, MERKUR managed to create a razor that is, at the same time, classic and modern. The lightweight tool features a traditional straight design with a closed comb head. Unsurprisingly, this type of design produces a straight cut that is very effective at all hair sizes. The grip, meanwhile, is just as straightforward. However, being made of high-grade metal, and featuring a non-slip texture, gives this razor an advantage over other products that have simple designs. In terms of performance: grip is large and cleverly designed, its handle is perfect for the hands of a man. It also allows swift, effective movements that can make the difference between a regular and an excellent shave. Regarding its cutting action, the razor is also worth looking into. Its double edge design allows great versatility while shaving, providing a choice between different levels of shade. This versatility is further enhanced by the razor’s knurled handle as it provides enhanced maneuverability. Its compatibility with universal double-edged blades. Apart from providing you with a variety of option for choosing replacements, this characteristic greatly diminishes the cost of keeping yourself provided with them. Depending on your personal preferences, facial hair type and shaving style, the blades can be used with a closed or an open comb head. The product can be disassembled into three parts for easy cleaning. Closed comb head fits all standard double-edge razor blades. Non-slip grip for greater precision. Provides a smooth transition to the traditional wet shaving method. Not good for shaving difficult spots. Does not provide a truly close shave. Difficult to lock into place. It has six blades and also features a patented angulated blade platform that increases its effectivity, resulting in a smoother shaving action that requires fewer strokes. Dorco prevents the accumulation of debris on your face as you shave. Each one of the six blades that comprise each razor head for the Dorco Pace 6 Plus is made of high-quality metal. These blades are fine and sharp, resulting in a smoother shave with less effort on your part. In fact, these blades allow you to dry shave without a problem. However, when you use this tool in combination with a quality shaving cream, the results are second-to-none. Also, all Dorco blades are compatible with all Dorco handles. Regarding its performance, probably it’s the best in Dorco family. Its six-blade design proves to be efficient, removing dense concentrations of hair in a couple swift strokes. Also, the blades are very durable. This is not only due to their material but also the design of the razor cartridge itself: Allowing being opened, each cartridge can be thoroughly rinsed and cleaned after each shave. Its head uses six blades simultaneously for an extra-close shave. Patented angulated blade platform for a super-close shave. Seamless blade construction prevents debris accumulation. Cartridge and handle interchangeability for shaving customization. Open cartridge for easier cleaning. Inadequate and ineffective lubricant strip. May pull a hair from time to time. Despite not having all the bells and whistles that other razors for men on the market have, the BIC Hybrid 3 is solid piece of design that does its job right, however it isn’t the best razor on the market. Its cartridge has three blades and tries adapt to the contour of your face. This is helped by its pivoting head. Also, this razor adapts to the level of pressure you decide to give it. Like many products of its kind, the BIC Hybrid 3 has a lubricating strip that helps get your skin ready for shaving. Due to its design, however, this lubricating strip also functions as a preparer for the hair that you want to get rid of, flattening it out and allowing the razor to glide through your face as it cuts. In addition, the gel that is contained in the lubricating strip provides aloe and vitamin E, nourishing and soothing your skin as the hair is being shaven. Being a disposable razor, the BIC Hybrid 3 is meant for only a few uses before it needs to be discarded. Each cartridge can be used 2-3 times before it begins to become dull. Meanwhile, its ergonomic handle is tough and durable enough to resist many uses. This makes this BIC product a great option for being used an emergency backup or travel razor. The product also works great for on-the-go touch ups. Ergonomic handle provides a great grip. Pivoting head helps the razor adapt to the contour of your face. Enhanced lubricating strip for extra glide. Handle made of cheap plastic. Blades not as sharp as one would wish. This professional-grade straight razor by Utopia Care is a great option for experienced shavers who want to go for the more sophisticated beard styles. It’s also a perfect option, for getting a close and clean shave on the regular. The razor features a blade cover that, somehow, looks simultaneously classic and edgy. It’s design is very effective in terms of maneuverability. The body of the Straight Edge Razor is made of high-quality brass, and it features a chrome finish that, apart from enhancing its already-good looks, protects this product from rust and corrosion. What’s more, the razor is very ergonomic, resulting in a comfortable grip that allows an easy maneuvering that is great for details and difficult spots. Because it uses easily-replaceable derby blades, this razor can be used for years without any sort of maintenance. Taking into account all its characteristics, it becomes apparent that this Utopia Care razor for men is not well-suited for beginners. However, experienced shavers and barbers are sure to enjoy its features, not to mention its overall quality. While this type of razor undoubtedly requires a bit more patience and practice than its counterparts of a more disposable persuasion, using it can be rewarding due to its efficiency and smooth action. Black matte finish over stainless steel helps prevent rust from forming. Includes 100 premium derby blades. Features flip-able blade cover for added protection. Features comfortable metal grip for easy maneuvering. Capable of providing a professional shave. Difficult to use and master. Requires learning certain shaving techniques. Not as safe as other types of razor. The Gillette Sensor2 Plus is a disposable razor that aims at providing quality shaves on-the-go. It features twin blades made of quality metal and coated with chromium. Each cartridge also has a lubricating strip that contains a soothing gel. Its grip is ergonomic and comfortable despite its reduced size. All in all, this product gives you up to 4-5 shaves for each cartridge you arm it with. Being disposable, the Gillette Sensor2 Plus is not made of high-quality materials. Rather, it is made of a lightweight plastic that, sadly does have a cheap feel to it. It does its job efficiently, allowing quick strokes and precise maneuvering. This last advantage is largely due to the razor’s pivoting head. Its twin blades are adaptative and sharp, resulting in a smooth shave. They are also fine enough to reach the difficult spots on your face without using excessive pressure or force. The product also comes with a ZipPak resealable container that makes it easier and more comfortable to carry while traveling. All in all, this is a practical razor that, if you are always on-the-go, is worth checking out. Ultragrip technology makes its handle very ergonomic. Its pivoting head allows the razor to adapt to the shape of your face. Comes in ZipPak resealable packaging. Provides up to 4-5 shaves. Cuts and bumps are regular. The Philips Norelco OneBlade is one of the most visionary razors on the market. Its one-of-a-kind design is aimed at making its shaving action more versatile and efficient than that which is offered by traditional razors. As a matter of fact, this electric razor is capable of trimming, edging and shaving any length of hair. However it’s best for short hair shaving! Also, you can’t use this electric razor for quick shaving. By integrating a fast moving (200 movements per second) cutter with a dual protection system, the Philips Norelco OneBlade can reduce the facial hair to a bare minimum. Granted, its design does not allow this razor to produce the closest shave possible. However, the product can shave to a level that is, at one time, comfortable and elegant. In addition, the razor’s mobile head allows it to follow the contour of your face as you shave, resulting in added precision. Due to its patented technology, each spare blade for this product can be used for up to four months before it needs to be changed. This is a lot considering the relentlessness with which it goes through even the thickest, longest facial hair. Furthermore, it can be used for wet and dry shaving alike, and it can be rinsed with water without risking malfunctions. Despite being a relatively powerful electric tool, the Philips Norelco OneBlade is quiet while it works. Each individual blade lasts up to four months. Trims, edges, and shaves any length of hair. Glide coating and rounded tips for protecting your skin. Can be used for dry or wet shaving. Capable of shaving long hair without previous trimming. Not well-suited for close shaving. Can be harsh on sensitive skin. Razor head structure made of cheap plastic. The Dollar Shave Club is an online service that provides everything you could possibly need in terms of shaving and grooming gear. It provides various types of kits that can be personalized according to your personal needs and desires. These kits are delivered to you as often as you like them to, and they can be modified or canceled at any point in time. The greatest thing about the Dollar Shave Club is how convenient it is. It eliminates the need to go shopping for spare blades, shaving cream, aftershave or anything else you may need in order to look your best. Having that many different options allows you to try new products and experiment with different styles, becoming a more sophisticated man as a result. Personally, I have learned a lot about men’s grooming by using this service. Allows you to try various different shaving products. Home delivery according to your personal needs. Includes gifts and bonus items. Occasionally you may get stuck with an undesired product. If possible, take a warm shower before shaving. If not, wash your face with warm water or use a hot towel on it. Next, if available, use a pre-shave soap, cream or water-soluble pre-shave oil. At this point, if you are going for a dry shave, you are ready to go. If you are going for a wet shave, however, evenly apply the shaving cream to your face using a shaving brush. • Sharpness: This is a no-brainer. The sharpest the blade, the less stubble. What’s more, even though it sounds counter-intuitive, a sharp blade will prevent you from cutting yourself. If you didn’t know, pressing down on the tool does not result in a closer shave. In fact, the most important factor for getting a close shave is the sharpness of the blade. • Number of blades: To the uninitiated, the number of blades a razor has may seem superfluous. However, it actually makes a difference. While razors with three or fewer blades can get rid of most of your beard hair, they are typically not efficient enough to cut the hair at skin level. If you want a close, smooth shave, look for a razor with four or even five blades. • Ergonomics: To get the best shave possible, it’s incredibly important to choose a razor that adapts to the shape of your face. As you may know, the best angle for cutting hair is at about 30 degrees. Luckily, that angle is easy to achieve as long as the design of the razor allows it. For that reason, it is highly advisable to get a razor that’s movable and flexible. What’s more, each facial hair that you have grows in a different direction, making it absolutely necessary to have a tool that can be used in all directions. • Lubrication: Some razors have moisturizing and/or lubricating strips that act as you shave. This feature is nothing but advantageous, so it’s very advisable that, given the opportunity, you choose a razor that has it. • Use: If you have already used a razor past its recommended lifespan, you would be well advised to get either a new one or a replacement blade. This may be a hassle, but shaving with an old razor is one of the greatest disservices you can do to your skin. • Direction: Go with the grain and if your skin isn’t gently, then you can go against grain. It’s best to test and see the results yourself. Just never go against the grain with a razor on the first pass. • Clean your face: After shaving and before applying aftershave, rinse and dry your face. Make sure it is completely free of leftover cream or hairs. Do it gently, however, as your face will be the most sensitive at this point. • Pour the aftershave onto your palm: When it comes to aftershave, less is more. Pour two or three drops of it on your palm only. If it is an aftershave of a thicker consistency, try a single small gob of it. • Rub your palms together: When applying aftershave, you need to use your two hands. However, it is not necessary to pour the aftershave on both hands. You can simply rub your hands together for a couple of seconds in order to transfer the substance to the other hand. • Let some alcohol evaporate: Typically, aftershave has a certain amount of alcohol in its content. If this is the case, try letting some of it evaporate before applying it to your face. The reason for this is that alcohol can dry up your skin. To do this, simply hold your hands open and with the palms up for a few seconds. • Massage it into your skin: Finally, apply the aftershave to your face directly by rubbing your hands on it. Use a gentle downward motion, beginning from the top of your jawline and moving towards your chin. 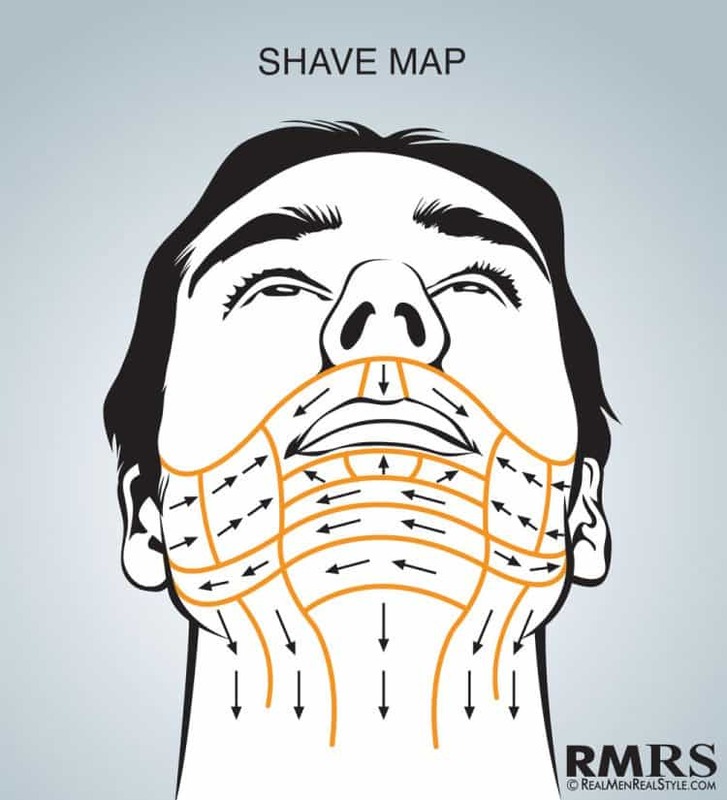 To ensure the aftershave penetrates your skin, you can also massage the entire facial area where your beard would be. If you decide to do this, try using circular motions. A shaving razor is among every man’s most personal and important possessions. Consequently, only you can choose the best razor for yourself. Hopefully, however, this comprehensive guide will put you on the right path for doing just that.